Another recipe crossed off my Foodie To-Do list! Other than my constant struggle with any recipe that involves making icing look neat and/or pretty (I like to say I make "rustic-looking" desserts), these sweet treats were really fun to make, and a creative twist on the half-moon cookies I loved growing up. I made these as a welcome treat for my dear friend Wendy who came to visit recently. She's one of my closest friends, but we had never met in person before! Believe it or not, we met... online! About a year and a half ago, when we were both planning our weddings, we connected on the forums of a popular wedding blog, and had ridiculous amounts of coincidental things in common. Since then, we've become really close, emailing/writing/talking almost every day. I'm so honored that she made the trip out here from the East Coast, and we had the best time. Stay tuned for a detailed account of an epic feast we cooked together. 1. Preheat oven to 350 degrees F. Line two baking sheets with parchment paper, or grease and flour the pan well so the cookies don’t stick. In a medium bowl, sift together flour, cocoa, baking soda and salt. 2. Using a mixer, beat 5 Tablespoons of butter with the granulated sugar until fluffy, about 3 minutes. Beat in the egg, food coloring and 1 teaspoon vanilla. Beat in the flour mixture alternately with the buttermilk until smooth. 3. Place 1/4-cup scoops of batter 2 inches apart of the prepared baking sheet, spread the batter out a bit with a butter knife. Bake until a toothpick inserted in the center comes out dry, 12 to 15 minutes. Let the cookies sit for 5 minutes, then transfer to a rack to cool. 4. To make the glazes: In a bowl, whisk together the powdered sugar, 1/2 teaspoon vanilla extract, 1 tablespoon of corn syrup and 2 tablespoons hot water, until smooth. That’s your vanilla glaze. 5. In a separate bowl, melt the butter and the chocolate in a microwave for about 1 minute. Add the corn syrup and stir until smooth. That’s your chocolate glaze! 6. Once the cookies are cooled, face them all bottom side up of a clean surface. 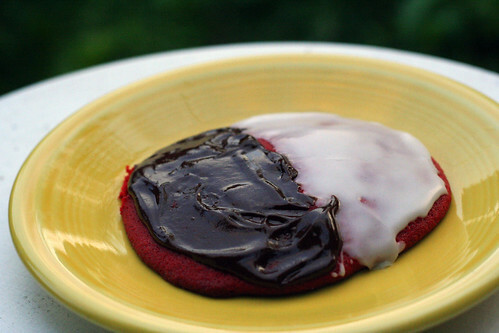 Spread half of the cookie with vanilla glaze and the other half with chocolate glaze. Refrigerate for 20 minutes to set. Enjoy! I love that one of your blogger friends came to visit!! that is so awesome! The cookies look great! i made these a while back and they were a hit! Isn't the cookie just soft and cakey and perfect!??! Those look so interesting and tasty. I have black and white cookies on my foodie to-do list, but red velvet... well, that's cranking it up a notch! Love the sound of these! Also, very cool that you met one of your blogger friends =D. I am glad you crossed these off your list of things to make because now I am going to have to add it to mine. I have such a soft spot for black and white cookies. I even made Everyday Baking's black and white cupcakes a few weeks ago. AAAAGGGGHHHHH I'm just catching up on my reader!!! Everybody, these cookies were **amazing**. So was my visit. Amy is amazing. That is all.